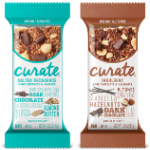 Receive ONE FREE Curate® Bar (any variety, 1.59 oz.) Available in most stores. This Friday, May 6, 2016 – ONLY, you can load a coupon to your Kroger (or Affiliate) Plus Card for one FREE Curate® Bar. This bar sounds delicious! Although 5/13/16 is the only day that you can load the coupon, the coupon offer is redeemable through 5/29/16.